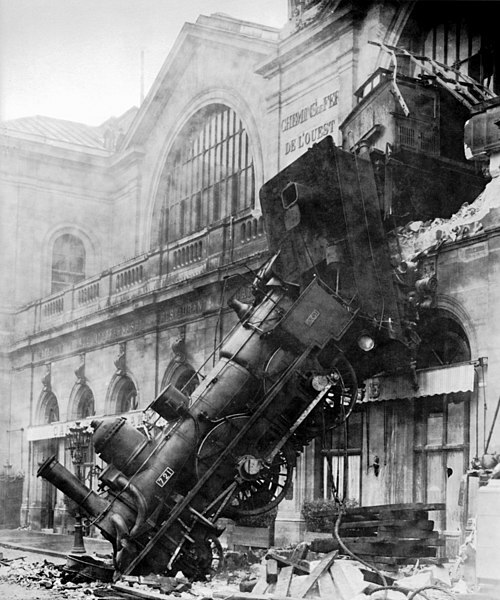 In 1895 an express train travelling from Granville to Paris overran a buffer stop and crossed over thirty metres of concourse before plummeting through a window at the Gare Montparnasse. One hundred and seventeen years to the day after that catastrophic but oh-so-photogenic moment, Louis Barabbas & The Bedlam Six release their latest single “Three Down, Four To Go” like a steam locomotive through a station wall. In the manner of most train wrecks, however, this release has not been on the cards for long. The release date itself is an auspicious one throughout history, full of great leaps (both literal and metaphoric – some positive and some, like the train, less so). 22nd October was, in 1797, the day of the first recorded parachute jump (by André-Jacques Garnerin) and, in 1879, Thomas Edison’s first successful test of the incandescent light bulb. The accompanying music video is also a little different from The Bedlam Six’s usual promotional material. This one is being created entirely by the audience. “Three Down, Four To Go” by Louis Barabbas & The Bedlam Six is released through Debt Records on Monday 22nd October 2012. There will be two launch parties: the first at Islington Mill in Salford on Thursday 18th October and the second at The Picket in Liverpool on Saturday 20th October.